Cancer. One very powerful word that can evoke feelings of fear, pain, triumph and loss. Nearly every person’s life has been in touched by cancer in one way or another and our dogs & cats are no different. The incidence of cancer in dogs is about the same of that in people. Cats are less likely to develop cancer, but when they do it is often more severe. The most obvious signs of cancer are swollen lymph nodes and growing / changing lumps, but cancer can emerge in many forms. Other chronic warning signs that can be overlooked as your pet ‘just not feeling well’ include lethargy, weight loss, vomiting and diarrhea, coughing, limping, swelling, difficulty urinating, oral odor or a wound that doesn’t heal. An enlarged abdomen could be a sign of a growing mass inside the pet’s body and unexplained bleeding from the mouth or nose could mean a tumor in the head. These symptoms do not necessarily mean your pet has cancer, but you should still mention them to your veterinarian to be sure. Dogs and cats live in our homes and are thus exposed to the same carcinogenic materials as us so they can develop cancer for many of the same reasons. Environmental toxins, second-hand cigarette smoke, radiation, UV rays, pollutants, viral infections, trauma, stress, artificial chemicals found in food, exercise and even digestion can cause normal atoms or molecules to lose electrons. This change to the molecular structure creates a highly reactive molecule called a free radical. Free radicals within the body usually contain oxygen atoms so another name for free radicals is “reactive oxygen species”. Free radicals are looking to steal electrons from other molecules so they can easily create a domino effect of molecules stealing electrons creating more free radicals. Everyone has some free radicals in their bodies, but when toxins create too many free radicals they can damage cell membranes, cell proteins and even DNA. Once the DNA is damaged it can begin to replicate the error which could trigger abnormal cell growth – cancer. Purebred animals tend to have a higher hereditary predisposition toward different types of cancers because they have been bred by people to promote certain physical traits, which limits genetic variability. Once you start selecting for a specific look, it becomes easy for genetic mutations to pop up within a bloodline. Mutts have a bigger gene pool so they are less likely to have hereditary mutations, but they are still at risk from environmental causes. 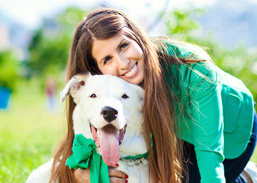 What can I do if I think my pet has Cancer? Any time you have concerns about your pets’ health you should always see your vet because they know your animal’s individual history and have the tools to make a diagnosis & treatment plan. Your vet will want to perform a thorough physical exam, do blood tests and probably take radiographs (x-rays) or do an ultrasound. In order to confirm the diagnosis of cancer, a biopsy will need to be done. A biopsy is a minor surgical procedure where the vet removes a small tissue sample so it can be tested by the lab to see if cancer is present and, if so, determine the severity. Because there are so many different types of cancer, the treatments can vary too. Your vet will assess your animal and determine if surgery, chemotherapy, radiation or immunotherapy are right for your animal. Severe cases may be referred to a veterinary oncologist (a vet that specializes in treating cancer). When detected and treated early you have a much better chance of beating it! Today’s advances in both human and veterinary medicine can provide some form of benefit to nearly any patient and more than half can be cured completely. Consult with your veterinarian before giving antioxidants to a dog or cat that is already being treated for cancer because some supplements can interact with drugs, making them less effective. While more research needs to be done to come to a stronger conclusion on these nutrients’ roles in cancer-fighting health, it is clear that there are many pathways that can benefit from good nutrition. Many of the actions these supplements theoretically take can be extrapolated into new treatments to help improve the lives of pets and the people who love them. The immunosignature of canine lymphoma: characterization and diagnostic application. The efficacy and adverse event profile of dexamethasone, melphalan, actinomycin D, and cytosine arabinoside (DMAC) chemotherapy in relapsed canine lymphoma. Identification of prognostic factors in canine mammary malignant tumours: a multivariable survival study. Prognostic value of histological grading in noninflammatory canine mammary carcinomas in a prospective study with two-year follow-up. Adoptive T-cell therapy improves treatment of canine non-Hodgkin lymphoma post chemotherapy. Differential effects of selenium on normal and neoplastic canine mammary cells. In vitro and in vivo evaluation of combined calcitriol and cisplatin in dogs with spontaneously occurring tumors. Role of vitamins, minerals and supplements in the prevention and management of prostate cancer. Modulation of prostate cancer genetic risk by omega-3 and omega-6 fatty acids. Vitamin C effect on mitoxantrone-induced cytotoxicity in human breast cancer cell lines. Copper-zinc superoxide dismutase-mediated redox regulation of bortezomib resistance in multiple myeloma. Status of oxidative stress and antioxidant levels in smokers with breast cancer from western Nepal. The challenge of rational development of complex natural products as cancer therapeutics. Complementary and alternative medicine use among long-term survivors: a pilot study. Deregulation of microRNAs Let-7a and miR-21 mediate aberrant STAT3 signaling during human papillomavirus-induced cervical carcinogenesis: role of E6 oncoprotein. Genes related to suppression of malignant phenotype induced by maitake d-fraction in breast cancer cells. Effect of various natural products on growth of bladder cancer cells: two promising mushroom extracts. Chemosensitization of carmustine with maitake beta-glucan on androgen-independent prostatic cancer cells: involvement of glycoxalase I.